That's definitely one way to kill the mood! 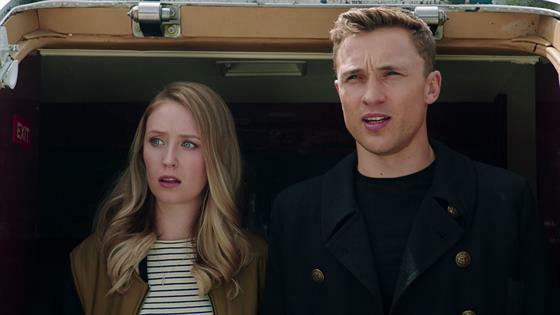 On this week's episode of The Royals, Prince Liam (William Moseley) is headed out of town for the weekend to meet the parents of Greta, the girl he's only dating to get info about his brother. So romantic! Things were going just as planned before he finds out some terrible family news. "12 bedrooms and 16 baths. Your parents' country house makes the palace sound quaint," Liam jokes with Greta. "Truthfully, I'd prefer for it to be smaller. Then I could make a case for us to be in the same bedroom," she responds. "My mom and dad are old fashioned. They'll put you down the hall from me." The Royals King's Address Premiere Ep. Ever the gentleman, Liam agrees that he's all for playing by the house rules. Sadly, their moment is interrupted by a notification on Liam's phone that explains there has been an assassination attempt made on King Robert's (Max Brown) life. Even worse news comes when he abruptly finds out who they suspect—him. "Someone tried to shoot my brother," Liam shares upon finding their plane surrounded by palace security with their guns drawn. "I guess they think it's me."